The power of Mordor stretches across Middle-earth, darkening the hearts of all who fall under its shadow and threatening the peaceful lands beyond its borders. Only the bravest warriors can stand against the spread of evil when a band of desperate Dorwinions come to ask for aid. Your team of heroes will embark on a dangerous journey into darkness that takes you down the River Running to the capital city of Dorwinion, and further into the Hills of Rhûn. There is no telling what horrors await you just beyond the borders of Mordor. 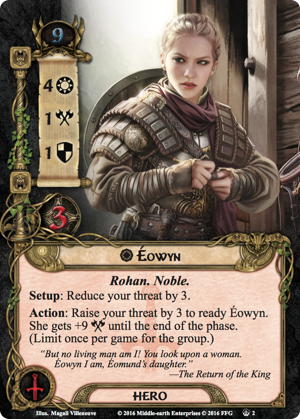 Fantasy Flight Games is proud to announce A Shadow in the East, the eighth deluxe expansion for The Lord of the Rings: The Card Game—now available for pre-order at your local retailer! As the start of the Vengeance of the Mordor cycle, A Shadow in the East takes you to the lands of Rhûn that rest in the shadow of Sauron’s domain. Here, you must embark on a new quest through three original scenarios built from 156 cards, including two heroes, 10 quest cards, 29 player cards, and 115 encounter cards that pit you against the forces of Mordor and the corrupted souls who long for the dark days of Sauron’s rule to return. To begin your adventures in this deluxe expansion, The River Running quest has you traveling along the titular river on your way to Dorwinion, where a great darkness has befallen this fair country. You have been tasked with investigating a string of disappearances but, before you can even begin your mission, you are attacked by raiders in the night. They set fire to your boat, trapping you on the east side of the river. Now, you must outrun the likes of the Easterling Outrider (A Shadow in the East, 13) and other deadly pursuers as you flee on foot. If you survive long enough to reach the capital, Danger in Dorwinion takes you to a troubled city where a hidden evil lurks in the shadows. Fear grips the heart of the city as the disappearances weigh heavily on the hearts of its citizens, but few will speak of it. Those who do often go missing themselves. Some say that a cult has taken root in the city and they are behind the abductions. You must proceed with caution, lest your investigation attract unwanted attention and deny you any chance to rescue the missing. Finally, in The Temple of Doom quest, the clues uncovered in your search lead you into the Hills of Rhûn, where the remains of an ancient temple built to honor Sauron taints the landscape. Within its walls rest terrible reminders of the horror that awaits the realm if you should ever fail in your vigilance. And somewhere in the twisting tunnels, the missing captives are held by an evil force you would rather leave forgotten, but innocent lives are at stake. While some have suspected that shadows have been gathering in Mordor for some time, the question remains: why would their forces choose to stir now? A Shadow in the East includes a single copy of The One Ring (A Shadow in the East, 1). No longer an objective, you may bestow this attachment on any hero able to hold it. The dark power of the Ring reduces your threat elimination level by five, which may encourage you to give it to virtuous warriors like Aragorn (The Watcher in the Water, 53) or Éowyn (The Flame of the West, 2), who offer some abilities that can help to counter this effect. 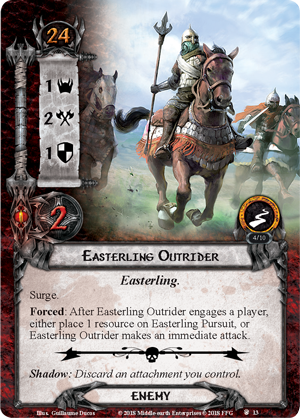 While The One Ring was once nothing more than a terrible burden, A Shadow in the East gives you the chance to tempt fate and draw upon its powers by using new Master cards. 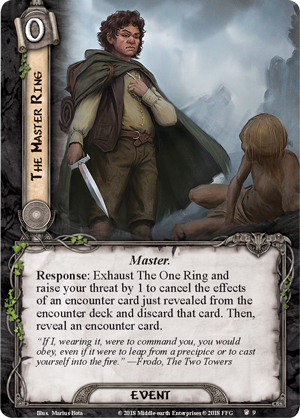 The moment that The One Ring comes into play, you may search your deck and add one of these cards to your hand, ensuring that you can bend the ring to your will, even if only for a short time. 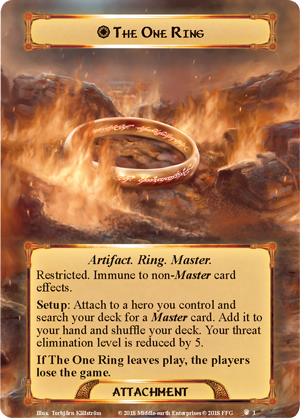 For example, The Master Ring (A Shadow in the East, 9) allows the Ring-bearer to exhaust The One Ring and raise your threat in order to cancel and discard an encounter card that you cannot bear to face at this time. Such powers can only be used by those who control The One Ring, and they come with a heavy price—if The One Ring leaves play for any reason, you lose the game. You must protect your Ring-bearer at all costs! Of all the heroes you may add to your Fellowship, there is only one who has borne The One Ring before and truly understands its power. But do you dare to trust them? A Shadow in the East introduces a new, wholly unique, double-sided hero and enemy in the form of Sméagol (A Shadow in the East, 72). 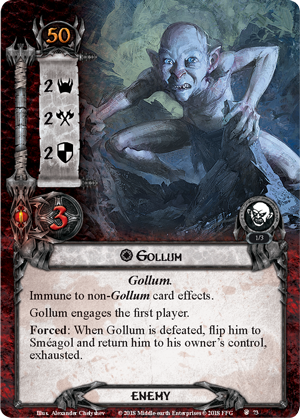 While you may have encountered Gollum as an enemy in the past, this is Sméagol’s first appearance in The Lord of the Rings: The Card Game, and his first chance at redemption. 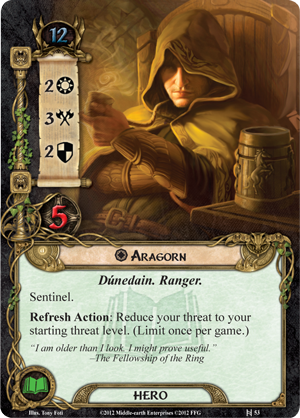 In order to remain free of the pull of The One Ring, Sméagol cannot have attachments, but he can still prove an invaluable guide for your party, letting you draw a card when you travel to a location if you’re willing to raise your threat. But the corruption of The One Ring is hard to deny. 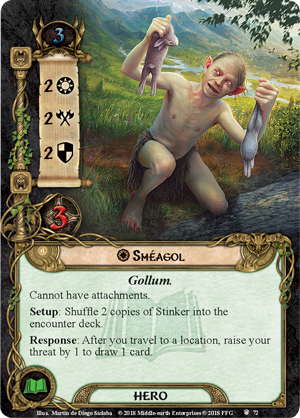 Should you select Sméagol as your hero, you must shuffle two copies of Stinker (A Shadow in the East, 71) into the encounter deck. 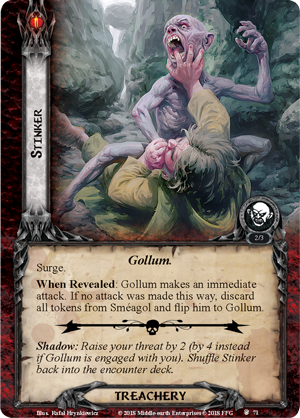 If either copy of this card is revealed, the hero Sméagol flips and becomes Gollum (A Shadow in the East, 73), turning on the first player and engaging them in combat. He will continue to fight your heroes until he is defeated, at which point he flips back to Sméagol and returns to his master’s control, exhausted. As the pitiable creature struggles with his internal conflict, can you hold the crimes of one corrupted aspect against the other? It has all led to this. The shadow of Mordor approaches in the East and Middle-earth’s bravest heroes must rise to meet it. If you should fail, Rhûn will fall and soon, all of Middle-earth will follow. Are you ready for the challenge? Gather your Fellowship and stand united against the darkness! Pre-order your copy of A Shadow in the East (MEC77) at your local retailer today! Otherwise, be sure to look for this deluxe expansion when it hits retailers in the third quarter of 2019!